Ultimate accuracy? Listening to the $80,000 Meyer Sound Bluehorn system | What Hi-Fi? Best known for big PA systems and pro studio set-ups, Meyer Sound's new Bluehorn speaker system aims to deliver the ultimate in clarity and transparency. So we went for a listen. You may never be lucky enough to hear these speakers, and that’s a shame - but you probably have heard some relation. The new Bluehorn System from Meyer Sound is the culmination of decades of experience in the audio industry, both on the consumer and professional audio sides. Promising “absolutely unique sound”, the Bluehorn System borrows ideas and technologies from Meyer Sound speakers and systems used in film and music studios, live music venues (including recent Metallica and Ed Sheeran tours) and at festivals (Isle of Wight, Montreaux, Roskilde) over the last few decades. So if you haven’t heard Meyer speakers in action, you’ve probably heard something mixed on them. And Meyer Sound claims this new Bluehorn System really is something unique. Having had the pleasure of listening to them, we find few grounds for argument. There are two things to do when greeted by a system like this - one, try and understand a little more about the technology; two, listen to the things. After a brief chat with Paul Jarvis (Technical Services) and Roger Harpum (Business Relationship & Hospitality) from Meyer Sound, we decide to go straight to step two and catch up on the details later. It seems very much the way Meyer would like to do things - it’s quickly apparent it’s all about end product. We’re hearing the system at the Cornflake home theatre in London - we were last here at the beginning of 2017 to hear the room’s new Meyer cinema system, a £250k beast that’s completely hidden behind a transparent screen and walls. We're escorted into the room by in-house expert Peter Miller, who doesn’t hide his excitement at having the Bluehorn System at his disposal (albeit only for a week). It’s fair to say these speakers aren't discrete: two monstrous speakers stand either side of the screen. We’re told plenty of Meyer installs are hidden behind acoustically-transparent screens, however, so - if you’ve the space - you can even tuck speakers as hefty as these out of sight. That said, if you like that no-nonsense black monitor look, you might find these quite smart. The blue horn driver - coloured purely to differentiate them from other models - adds a flourish, though grilles are available if you want to cover that up. There’s no two ways around their size, though. We’re given the sweet-spot seat on the sofa and sit back to enjoy a playlist of tracks offering a little bit of everything. It’s 24/192 hi-res music on ‘weekend hack’ software on a Mac and plugged into the system, but we later also listen to a selection of our own tracks on Tidal via a Linn streamer. Did we mention how huge the speakers are? And yet, as we listen to Buena Vista Social Club's Chan Chan, they do their best to disappear. Instead, the sound of the band, the sound of the room in which they’re playing, the placement of instruments and the dynamics of the voices, takes over. The speakers, DSP and room combine to deliver a sonic experience that seems to make the physical position of the speakers irrelevant. You want a soundstage? This is a soundstage like we seldom hear - close your eyes and you can place the band. This track, and listening later to Lorde's Royals, demonstrates an impressive level of accuracy and realism, especially when handling voices. “Studio Master” has become something of a generic marketing term, but this experience is the real thing - every note in the recording is delivered with convinving clarity. All the processing and production required to get music from studio to your ear is elsuive, and instead you enjoy an intimate, immediate sound. As impressive as bare, natural recordings sound - London Grammar, Rebecca Pidgeon and Gregory Porter all get an outing, sounding thrilling in their delivery of detail and emotion - the Bluehorn speakers do strong work with electronic music, too. Consensual Worlds by Delerium shows the system capable of scale and rigorously organised sound dispersion. A synth-line laden with delay appears to travel from the front to the back of the room - we almost double-take. The speakers come with an external processor which takes care of phase correction and adds room equalisation. It’s clear the system knows both the dimensions of the room and how best to reach into every corner when the music demands it. The beauty of a really capable sound systems is how it can inflame your love of music and have you eagerly revisiting your favourite tracks. The very best set-ups can also have you hearing familiar music in a new light. Four Tet’s Two Thousand and Seventeen exists on a new plane of emotion thanks to fresh layers of detail in each plucked note of the main hook, as well as strings that reach new heights thanks to the dynamic reach of the system. Michael Jackson’s Billie Jean is as familiar as it gets, but we notice a rasp in the rolling bass line we hadn’t clocked before - and, due to the ruthless transparency of this system, wonder whether they might have dialled down the snap of some of those snares a smidgeon. An iffy recording this is not - but play one and this system will expose it. As film composer John Powell has said, “I have no time when working to enjoy what we did right. I need to hear when things are wrong so we can fix them, and I can hear those problems better with the Bluehorns.” Which is high praise. It’s hard to find an immediate point of reference for an $80,000 music system (and that’s before you pay for the mandatory installation and room EQ) so, much like driving a Ferrari or flying in a private jet, we instead simply know we very much like the experience, and would rather not go back to doing it any other way. So, about the technology itself. “I don’t really know much about the technology in it, they won’t tell me," says Jarvis. Ah. “It’s one of those things they want to keep guarded,” adds Harpum. Jarvis continues: “It doesn’t matter - the end result is what you hear. It’s absolutely unique in the world. I’ve spent the last 40 years working in studios for music and film, and I’ve never heard anything like it. And I never liked horn speakers before, and I never liked big speakers before.” And while there's an element of "they would say that, wouldn't they?" the proof is in the eating of the pudding. This one is certainly moreish. What we do know is what Meyer Sound is aiming for: “powerful, full-bandwidth monitoring with zero phase shift… to offer completely flat amplitude and phase response across the entire audible frequency spectrum”. 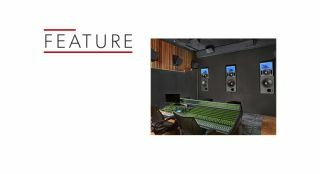 Fully active speakers with dedicated processing and room equalisation is how the company aims to achieve it, and it hopes to find its way not just into professional music and movie production studios but also into high-end consumers’ homes. The system is available in either stereo or LCR configurations, with each channel comprising a two-way mid-high loudspeaker, a separate low frequency element, and dedicated digital processing. But of course should you want you something more - a complete Atmos home cinema solution, say - Meyer Sound can of course meet your requirements. Founded by John and Helen Meyer in 1979, Meyer Sound has a history in live music and mixing studios that few can rival. And while big PA systems remain the company's bread and butter, the new Bluehorn System - which we're told is simply a "fringe project" - makes it clear the company is more than capable of turning out fine-sounding systems that are a little bit more real-world. A little bit. We just hope plenty of people get the chance to hear it. The best private home cinema in Europe?